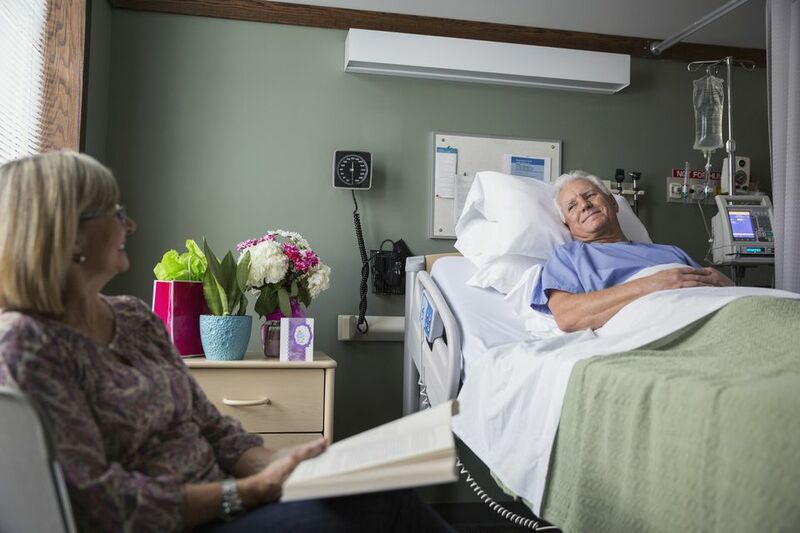 When a family member or friend is in the hospital, it can often cheer her up to see that you are willing to take time out of your day to stop by for a visit. Before you go, brush up on the rules of etiquette in a place where there are sick and injured people. Know the hospital rules. Most hospitals have their visitation rules posted in or near the main lobby. Before you visit your friend or family member, read them. Don't go if you are sick. If you have a fever, cough, or any other sign of sickness stay home. You don't need to spread your germs in a hospital where people's immune systems are weak. Be clean. Wash your hands before and after you visit your friend or family member. You don't want to take germs into or out of the hospital. Set a time limit. You don't need to stay for hours and hours, unless you are the spouse, parent, or child of the patient. Most of the time, 15 or 20 minutes is an adequate amount of time to allow. Don't stay too long, or you may interfere with the person's need for rest. Observe privacy. The patient has to give up enough privacy to the medical staff, but that does not extend to others. Before entering the room, knock and enter after you are invited. Observe personal space rules while you are in the room. Don't touch the equipment. Keep your hands off all the medical equipment. This includes tubes, monitors, and the actual machine. It is never okay to reset anything. Keep the noise down. The hospital is not a good place for loud voices, booming laughter, or ringing cell phones. Put your cell phone on silent or vibrate and plan to visit in a quiet tone. Let the family go first. If the hospital policy states that only so many people are allowed in the room at one time, family members should go first. After all, this isn't a party. Avoid fragrance. Don't wear perfume or heavily scented toiletries to the hospital. Some of the patients may have allergies, or worse, be on ventilators. Remain positive. When you arrive at the hospital, be as positive as you can and smile if it is appropriate. Don't share negative past experiences in the hospital, or you may frighten your friend or family member who is in the hospital. Don't go empty-handed. Bring the patient a card, gift, or a bouquet of flowers to help cheer up the patient. Leaving something for the person to enjoy later may help keep her spirits up after all the visitors have left. Keep your opinions to yourself. Avoid the urge to diagnose the patient, unless you are a doctor. Aunt Sadie might have had similar symptoms, but this is not the time to share them with the person in the hospital bed. Never tell the person how bad she looks, and if you are shocked by tubes and beeping machines, don't show it. Keep conversation light. Before you visit the patient, think about a few conversation starters to help prevent letting the conversation get too intense. Avoid discussing business, politics, or anything that may hinder the patient's recovery. Things you can talk about to brighten the patient's day include the weather, anecdotes about work that aren't stressful, and something embarrassing that is funny. Be considerate of a roommate. If your friend or family member is in a semi-private room, take the other person's privacy and need for rest into consideration. Keep your voice down and don't turn on the TV without asking if it would bother him or her. Remember that people can still hear when their eyes are closed. Whether the person is in a coma or simply resting, don't say anything that you wouldn't say if she were looking at you. She might be able to hear you. Don't sit on the bed. Unless the patient asks you to sit beside him, don't sit on the bed. Most hospital rooms have at least one chair, so use it if you need to sit. If not, you may ask for a chair, or you can remain standing. Honor the medical professionals. The patient is in the hospital for medical care, so honor them when they need to do a treatment. When the doctor or nurse comes in, offer to leave. Then step out of the room with a positive attitude and either wait by the door or in the waiting room. Before you leave the patient's unit, it is always a good idea to thank the people at the nursing station. If you're looking for some great gift ideas, most hospital shops have a variety of items. Make sure you choose something that's allowed in the hospital. No one expects you to be your usual cheerful self when you're a patient in the hospital. However, you still have an obligation to cooperate with the medical staff and do everything you can to participate in your healing. If you don't feel like smiling, then don't. The doctors, nurses, and therapists understand. Let your guests know when you're ready for them to leave. This is one time it's acceptable to show your guests the door.